Have you ever wondered what the meaning behind you bingo caller shouting out “two little ducks” or “doctors’ orders” is? Or are you familiar with ‘two fat ladies’? While some bingo lingo is clear as to what it means, others aren’t as obvious. The chances are you’ll be familiar with some of the best-known bingo calls, even if you’re new to the game. These nicknames for the numbers used in the game have been around since 1950’s Britain, when the bingo game first became popular. The game of bingo evolved dramatically over the years and today you can play the game online anytime. Some like to play the game for real money, while others like to play it for free, just for the fun of it. But they all share one thing: The love for the game of bingo. It’s said that these calls were originally designed to cover for the noisy and slow number generating machines back in the day. Whatever their origin, bingo calls serve to make the game more entertaining, with their mix of funny puns and innuendo. But where did they begin? When were bingo calls introduced? 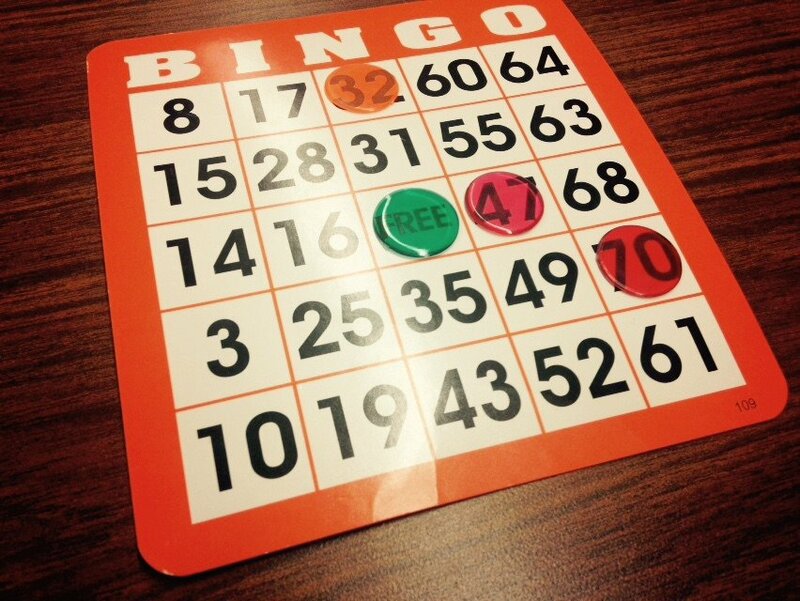 It’s hard to know when exactly bingo calls were introduced, but by 1930 there was a new process to choose the random numbers in a bingo session. There had been previous instances of the bingo caller fixing the game and calling out incorrect numbers, so now the players were allowed to take turns to throw a ball into a container with 90 numbered compartments. The player could then see which number would come up, and everyone agreed that this was a fair way of playing the game. However this process took time, and wasn’t really a practical way to play the game. Also in the 1930’s Army games of Housey-Housey were using the exact same bingo calls that we use today, which of course explains why so many calls have a military origins. The job of a bingo caller is considered quite an art in itself. In the 1960’s celebrity bingo callers were extremely popular, and until 2007 there was even a National Bingo Caller of the Year competition. Bingo calls are still a huge thing in bingo clubs today, and even on online bingo sites you’ll still find virtual callers. In 2003 in an attempt to modernise some of the outdated calls, Butlins and Gala Bingo published new official calls such as ‘J-Lo’s bum’ for 71, and ‘Jimmy Choo’ for 32. No matter what calls you might hear in bingo clubs, you’ll still hear the traditional “Eyes down” before the game starts. Most numbers have more than one call and the meanings behind them can vary. Some references are made to the appearance of a number, such as ‘duck’ for 2 as the figure resembles the animal. Others can give us a snapshot into the popular culture of post-war Britain when the game first became popular. For example ‘Doctor’s orders’ for the number 9 refers to the ‘No. 9’ laxative pill issued to soldiers in the First World War, and 26’s nickname ‘Pick and Mix’ indicates the cost of sweets in old money. A lot of the number calls are straight-forward enough rhyming slang; ‘cup of tea’ for number 3, and ‘tickety-boo’ for 62 are prime examples of this. Others are more onomatopoeic e.g. ‘clickity-click’ for 66. Some rhymes make a reference to popular culture, such as ‘jump and jive’ for the number 35, named after a dance move. Another cultural reference that changes from time to time, is number 10. Originally called ‘Maggie’s den’, has changed to ‘Tony’s den’, ‘Gordon’s den’, ‘Dave’s den’ etc over the years, depending on the Prime Minister. The number 52 ‘chicken vindaloo’ is known to have originated from a Butlin’s holiday camp in 2003. Another food related call is number 57 which is known as ‘Heinz Beans’ as there are 57 varieties of Heinz produce. Single digital numbers are often prefaced with ‘on its own’ and numbers that end in a zero are often called ‘blind’, e.g. 50 referred to as ‘blind fifty’. If two digits are the same number, such as the number 44, the caller might refer to them as ‘all the fours’. Of course every game will have its own favourite calls, and there are often regional alternatives depending where in the country you are playing bingo. Calls are always followed by the number itself, so you don’t need to worry about learning them all. If you’re familiar with pre-decimalised British currency, you might also understand the reference to calls of “was she worth it?” when the number 76 is called out. In old money, 7 and 6 was the cost of a marriage license –and typically the crowd in the bingo hall would call back “every penny!” when the question was called out. If you’re looking for a more philosophical bingo call, you might prefer Gandhi’s breakfast for the number 80 (8 –ate, 0 – nothing). Alternatively three’s ‘unlucky for some’ for 13, and ‘lucky seven’ – which both are common across many different cultures. Here’s just a snapshot of a few intriguing and odd reasons behind some of the classic British bingo calls. No matter how advanced and high-tech the game of bingo becomes in the future, it’s always worth remembering a few of these classically British terms, and where they began.